The Community College of Spokane ran out to a big lead in this April 1986 game and Darren Cooper did the rest, according to The Spokane Spokesman-Review. Spokane picked up 16 hits and 11 runs. Cooper, in turn, pitched a complete game, giving up four hits, two runs and striking out nine, The Spokane-Review wrote. Cooper went on to turn pro four years later, in 1990, after a stint at at least one other college, Lewis-Clark. His pro career, though, was brief. He played in a single season. 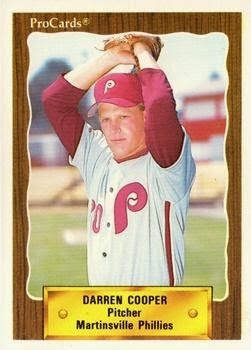 Cooper's brief pro career began and ended in 1990, signed by the Phillies as an undrafted free agent out of Lewis-Clark. Cooper was a native of Yakima, Wa. He spent the summer of 1985 with the local American Legion team. He went 17-1, with 115 strikeouts. For Spokane, Cooper picked up a save in an April 1986 game. The next month, he went six innings of relief, giving up three hits. Cooper went on to Lewis-Clark and then to the Phillies organization. With the Phillies, Cooper was assigned to rookie Martinsville. In 15 games, 12 starts, Cooper went 1-6, with a 5.08 ERA. It was his only season as a pro.